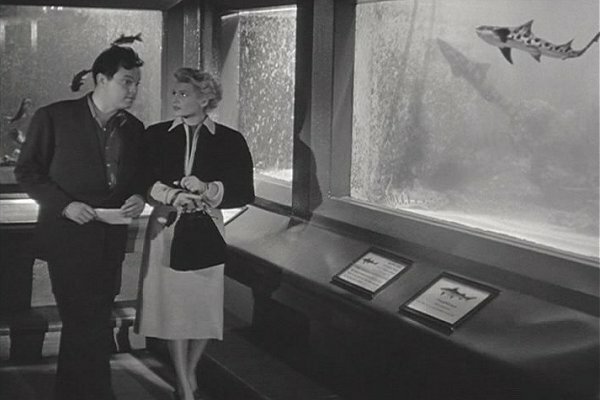 The Lady from Shanghai is a tight, 88-minute film about an Irishman living in San Francisco (perhaps the quintessential noir city) who makes his living working as a seaman for hire on the ships that come and go in the harbor. One night, he encounters Rita Hayworth, a wealthy woman of mysterious motivation (of course) with whom he has instant chemistry and who convinces him to join the crew of her husband's yacht. 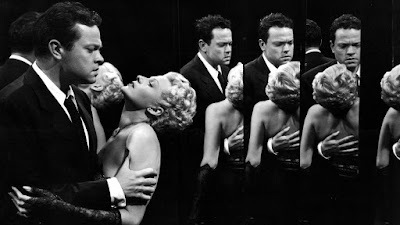 Smitten, yet well aware that he should avoid the situation, Welles' character nevertheless does as she wishes and soon finds himself in the middle of a complex murder plot that involves double and triple crosses. Through it all, Rita Hayworth is the alluring woman from Shanghai, tempting him further into the net that slowly tightens around him. I'm not a part of the film noir establishment (there actually is such a thing), so I'm not a hundred percent certain what the current reputation of this movie is. I know in the past it's been considered another one of Orson Welles' follies, but I suspect that time and fresh eyes have raised the value of this little gem to something more respectful. In truth, all the classic elements of film noir are here: the crackling dialogue, the stunning cinematography (here from Charles Lawton, Jr), the expressionistic symbolism (both visually and thematically), the sense of looming disaster, and finally, characters that are playing multiple angles. "What's a tough guy?...A guy with an edge...A gun or a knife, a nightstick, or a razor, somethin' the other guy ain't got. Yeah, a little extra reach on a punch, a set of brass knuckles, a stripe on the sleeve, a badge that says cop on it, a rock in your hand, or a bankroll in your pocket. That's an edge, brother. Without an edge, there ain't no tough guy." The words of Orson Welles and his performance are not the only reason to watch this movie. 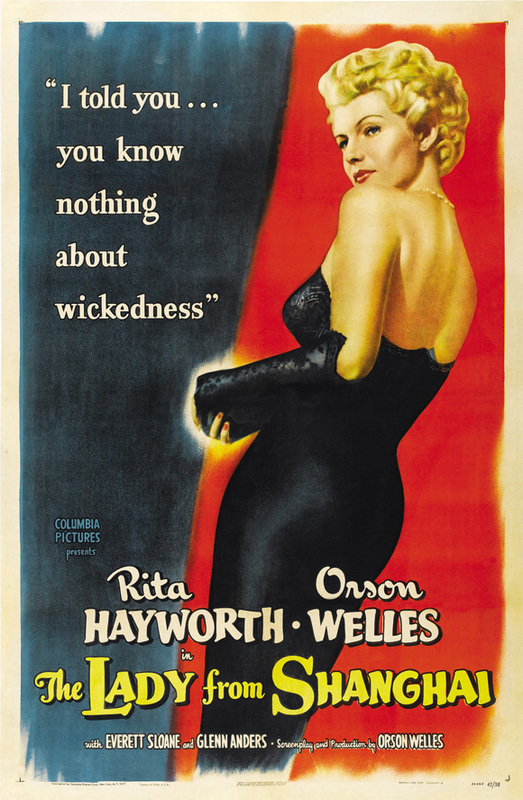 Rita Hayworth is absolutely wonderful in this film, playing a woman who is both dangerous and alluring, manipulative and yet still sympathetic. There are lots of mysterious and potentially-dangerous women in film noir, but it takes a very talented actress to show the layers of such a character without being relegated to just one of two of those characteristics. Hayworth is simply stunning, both physically and in her incredible screen presence. Famously, she chopped off her long red hair for this movie and dyed it blonde, something that the studio executives were certain would spell doom for this movie. Did that have an effect on the box office in 1947? It's very possible, but it would be a shame if something as superficial as a hair style kept audiences away from such a powerful story. Welles famously turned in a 155-minute cut of this film and Columbia Pictures executive Harry Cohn had it cut it down to 88 minutes to Welles' ire. While I love all of the elements I've mentioned above and think that the script and the cinematography are fantastic, I also believe that part of this movie's strength is that it flows quickly. I'm not sure I would want to see a 155-minute cut of this movie. In my personal experience, it's rare (not impossible) that a movie justifies such a long running time, and this one is no exception. Part of the appeal of this story is that we are caught up in the whirlwind just like Welles' character, whisked away to foreign shores before we even know what's happening or why. This brings me back to my original statement. Sometimes a great movie is born in spite of the best efforts of the people making it. Had Welles gotten final say on a two-and-a-half hour version of this movie, or had Cohn been able to fire Welles from one (or more) of his three duties on this picture, things would most likely be dramatically different. Besides, it's the final film that either stands the test of time or fades into obscurity, forgotten when the people who created it are no longer alive to tell their stories. Lucky for us, The Lady from Shanghai speaks for itself.